For England, preparing to take the field in Mumbai, two down with two to play, the six letters that should be uppermost in their consideration S – T – R – E – S – S or, strictly speaking, how to avoid being stricken with stress. Eddie Jones recently had some words of wisdom on the subject. If you know what you are doing there IS no stress. In other words, disabling stress comes when not knowing what to do forces its way into a sportsperson’s consciousness. So, if you have a plan and, crucially, if you believe in the plan and have no doubts or feelings of insecurity about the plan that you are being asked to follow or have chosen to adopt, you will bat or bowl without stress. The trouble comes when you play in two (or more) minds. The ‘should I, shouldn’t I?’ dilemma of being true to ‘my game’, true to my understanding of myself and … and playing in a way that is ultimately inauthentic, alien and pushed on you by outside forces. And In ‘Setting the Scene’ – Chapter 1 of ‘Bucking the Trend,’, Chris Rogers, describes how the former Cricket Australia executive Marianne Roux sat the Australians down and said ‘for every negative thought you’ve got to tell yourself to have five positive thoughts’. Rogers continues, “You spend so much of your time questioning yourself and competing against others that you need to find a way to use those doubts. To block them out successfully means kidding yourself, and how long can that last? Instead I find it best to know and own those doubts, and use them to sculpt a technique within my own limitations. By thinking my way through it, I’ve been able to find ways of succeeding where others have not …” before going for the jugular of the modern meme that is the perhaps greatest force for inauthenticity in modern batting, “There is, perhaps, something for others to learn from that, in an age where we constantly hear so much batting bravado talk, which can lead either to rapid scoring or rapid collapsing.” TM’s italics. Putting the pursuit of the brand before the authentic expression of personal capabilities is the reason that England has crippled (not a nice word but here, surely, justified) so many young batting talents in recent years? And it is why, in this Test series, stress has stalked the nets and dressing rooms and thrust itself on to the field of play, bringing calamity and dissonance in its wake. The England managers have only themselves to blame. They have created a cult. It has initiation ceremonies, rites de passage, through which novitiates must pass. Inside is security and access to magical knowledge and privileges beyond the ken of outsiders. There is a priesthood and leaders, whose authority must never be challenged. They have access to huge wealth and entitlements that can be withdrawn in a moment. Leaders come and go, but the orthodoxy reforms around new leaders. There is apparent equality yet power is held by the few. Novices are taken in at a young age and indoctrinated. Few if any are recruited later in life. There is perfect freedom within, provided the orthodoxy is never challenged. Cults have a way of ending in mass suicides when reality becomes inescapable and the dissonance too great to bear. But before then, we can change coaches, replace captains and welcome a new cap or two. Putting #45 Gayle Under Pressure Like in the First Match? 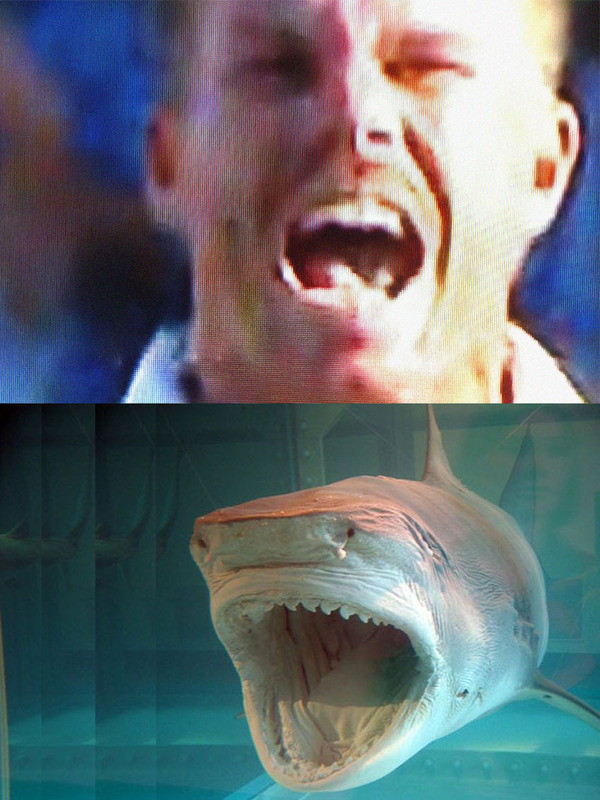 There is something about Chris Gayle and David Bowman from 2001 A Space Odyssey; the teeth as well as eyes. The Squire and Third Man have seen all the great ‘quicks’ produced by the game of cricket, from David Harris to … to Johnson. And their opinion? Johnson entertained them more than any other. And frightened them in equal measure. This is a man who could bowl a short pitched ball which, depending on the random orientation of the seam, could lift off like Saturn spinning through space and still be rising as it flew over the keeper’s head thirty yards back, or stay, as if at his command, lower than the rolls of the batsman’s pads, OR heights anywhere between these extremes discombobulating the batsman. And, depending on the point of release, he could fire the ball two yards outside off stump or two yards outside leg and any direction between those extremes … and he would frequently do so within a single spell. His physique and deportment were those of the Olympic athlete. His approach when full out delivered him to the crease like a piston driven engine, and then there was that ‘curvy flick’ of a drag from the trailing leg that appropriately each ball wrote a question mark in the air an inch above the bowling crease. His presence was both unsettling and somehow hilarious. Throughout his triumphs and disasters he was both ‘good sport’ and ‘a good sport’. People laughed at him but only when he was down. They did so like children prodding a dead snake and running in panic and hysteria when it appeared to strike back. In 2013 Lehmann rescued him from the wilderness of confusion and gave him back to lovers of fast bowling. His destruction of Jonathan Trott that summer and winter must qualify as one of cricket’s great tragedies and rank alongside anything staged by the ancient Greeks. Here, before our eyes, was what CLR James had known. And the puzzle and the delight? Johnson, this incarnation of Nemesis, this deliverer of retribution, approached his victim in the form of a cartoon character. How modern is that?! 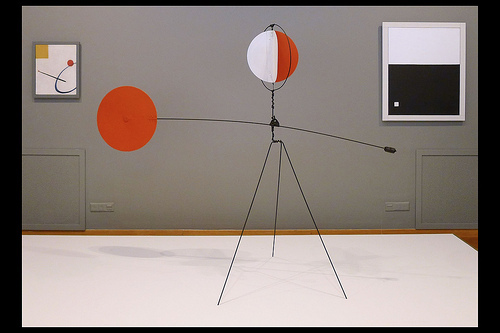 At long last, there’s a major exhibition of the work of Alexander Calder at the Tate. Calder bowled spin; obviously; and was a frequent visitor to cricket parties at the Great House. The Squire was given a preview as a number of the works are on loan from his private collection. He was accompanied by his old friend and cricketing enthusiast, Sally Tate. Third Man tagged along. Indeed TM could. Oft were the times he’d watched in awe that drift which this artist alone could achieve. 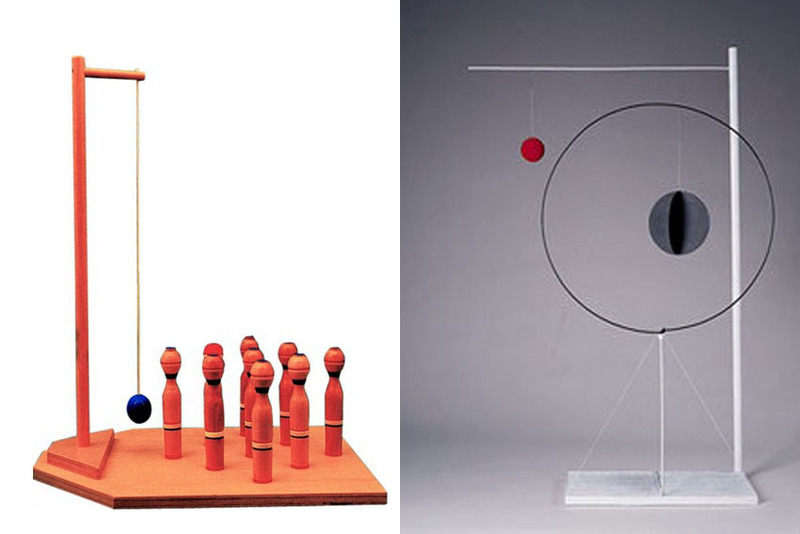 Many have wondered what first gave Calder the idea for ‘Object with Red Ball (1931)”. The story is simply this: Calder was guesting for the Squire’s XI in the annual match against the Rather Stuffy Artists Cricket Club. Later that night, the Squire suggested a game of ‘bar skittles’, which Calder, with his canny eye for line and flight and curve and space, played with facility, beating all comers. As dawn broke and the company walked back to the Great House, Calder excused himself and made his way with the Blacksmith to the Forge. Over an enjoyable late luncheon the Squire, rather taken with the piece, commissioned a weather vane for the top of the Pavilion, which, as those who have played at the Great House know resembles Calder’s later ‘Red and Yellow Vane (1934)’ with its quiet homage to the round arm bowling of Old Everlasting and is reproduced above below the headline. 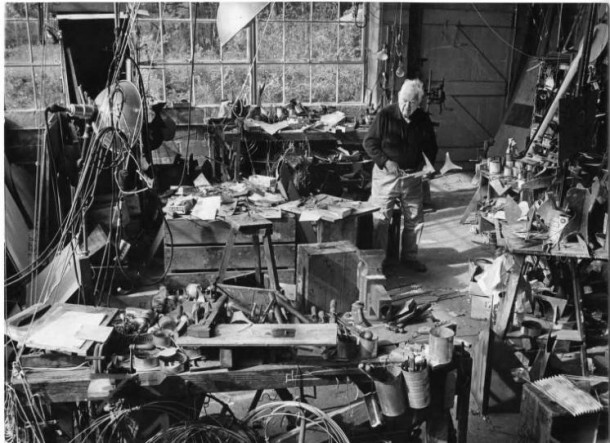 It is not generally known but when Calder died in 1976, a prototype bowling machine was discovered in a corner of his studio. It was another, but undelivered, commission from the Squire. Having rather typically stumped many an American connoisseur, who couldn’t make head or tail of the thing, the machine was transported to this country and now occupies ‘pride of space’ at the East end of the Great Gallery and, on rainy days, is brought into its proper use.